The Vikings were Scandinavians who colonized parts of Europe from the 9th to the 11th century. Vikings revered the sword above all weapons. The passing of a family sword from father to son was considered a major event. Even better was the knowledge that a sword had been wielded in battle or in a feud by a great warrior or nobleman. This gave the sword added status and was thought to imbue the blade with special powers. The Viking armory also included the spear and battle-axe, the first-line weapons launched against an enemy. The main Viking battlefield weapons employed during first contact with the enemy were the spear and battle-axe. One of the reasons why the sword usually took a secondary role in the initial phase of a battle was that the continual striking of one sword edge against another would have inflicted large nicks to the blade and eventually removed the consistency and effectiveness of its finely sharpened edge. Because of this, once the spear or axe had done its work, the Viking warrior would then draw his sword and look for exposed and softer areas of the body to attack. Skeletons of Viking battlefield victims unearthed by archaeologists consistently exhibit more spear wounds than sword cuts, highlighting the selective use of Viking swords in battle. RIGHT: A 9th-century Viking-decorated stone carving from Gotland, Sweden, depicts two soldiers fighting with swords. ABOVE: A Viking sword from the 10th century with lobed pommel. The wide, double-edged blade would have made it a very powerful weapon. A Viking warrior’s most common battlefield weapon, the spear, comprised a simple iron, broad-leafed or spiked point on a wooden (normally ash) shaft, with a total length of around 1—2m (3.2—6.5ft). Spearheads with wings were called barbed spears. The spear was extremely effective and used for both thrusting and throwing, with larger-headed spears being used for cutting. There is evidence that the spears used to cut through chainmail were used one-handed as well as two-handed. A skilled Viking spearman was reputed to be able to throw two spears at once, using both hands, and also to catch a spear in flight and hurl it back at the opposition. A sword was then used in close-combat fighting. The Viking sword pommel (located at the end of the hilt) is one of the most distinctive characteristics of a Viking sword. Most pommels were cast in solid iron (its weight providing a counterbalance to the weight of the blade), but there are also fine examples in bronze and also of iron inlaid with sheets of silver. Pommels ranged from the early pyramidal shapes of C.AD800 to the later, more complex pommels that were formed from triangular segments. The great artistry and imagination of the Viking metalworker is clearly evident in these pommels and cross guards, with complex interlaced and geometric patterns worked in both silver and bronze gilt. A scabbard (sheath or case) was made of two carved pieces of wood, glued at the sides and sometimes covered in leather or fur. The mouth and chape (the metal plate at the point) of the scabbard were sometimes mounted with decorated silver or bronze gilt. The sword would have been carried using a baldric (waist or shoulder belt). 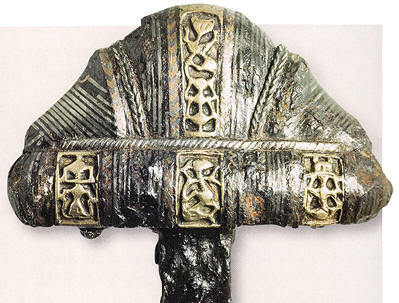 ABOVE: A Viking sword hilt with a cocked hat or lobed pommel. The decoration includes stamped abstract cartouches. When wielded with appropriate force, the Danish long-handled or “bearded” battle-axe was a devastating weapon. Its design was based on domestic Viking wood-splitting axes found throughout Scandinavia during the Viking period and evolved for use in battle. The battle-axe had a much larger head of either crescent or convex shape, which favoured downward blows, with a long wooden haft measuring l—2m (3.2—6.5ft) in length. Sometimes blades were forged with an especially hardened double edge. They could also be forged quite thinly to give the user a lighter, more easily handled weapon. ABOVE: A large two-handed Viking bearded war axe with socketed metal head fitted to a wooden handle. Underneath is a Viking socketed spearhead, probably from the 10th century, which would have been fitted to a wooden shaft. About 70—80cm (27.5—31.5in) long, the wide, double-edged blade of a Viking sword had shallow fullers, or so-called “blood grooves”. The grooves were not actually designed to allow the blood to run down easily but rather to reduce the weight of the blade and give it added flexibility. The Vikings had a very close relationship with their swords, borne out by the personalized names they gave them, including Gramr (“Fierce”), Fotbitr (“Leg-biter”) and Meofainn (Decorated down the middle”). Swords were not common or inexpensive weapons and it is likely that they were mainly carried by persons of rank and wealth. The smelting of iron ore with carbon to produce fine steel was well known to the Vikings and contributed to their reputation for producing blades of superb quality. They are best known for the complex process of pattern welding employed in their manufacture. Modern X-ray technology of surviving blades now enables us to see how Viking smiths produced patterned blades by welding long strips of iron and steel together, forging them into square rods then finally twisting or folding these rods into small bunches, so creating the hard inner core of the blade. The outer cutting edge of the blade was welded to this inner core, using the best steel. Finally, the blade was carefully ground and polished with acid to reveal the extensive patterning. Smiths worked hard to produce their own distinctive patterns. Their pride in such skilled work resulted in many blades being engraved with their makers’ names, notably “Ulbehrt’ “Lunvelit” and “Ingelri”. 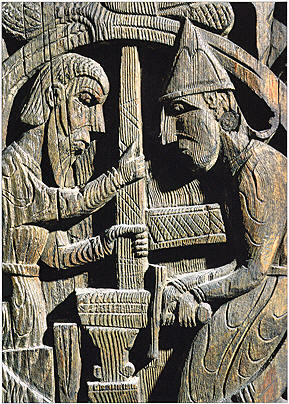 RIGHT: A 12th-century carving from a wood panel in a church in Setesdal, Norway, depicts a scene from the Norse legend of Sigurd (Siegfried). Here, the dwarf Regin and his helper are shown forging a sword on an anvil. The Vikings engaged in formal duels, or holmganga, to settle feuds. Holmganga roughly translates as “island going” and indicates that most duels took place on small islands where limitations of space (and, consequently, options for retreat), could be strictly enforced. The area of combat was determined by the laying out of a square cloth. Furrows were marked out around the cloth and the space was enclosed by a rope. Each of the combatants was allowed a second whose role was to hold the warrior’s shield. Swords were the weapon of choice. The duel did not commence with both warriors rushing at each other. Instead, each man took his turn at making one strike against his opponent. If a combatant chose this opportunity to back off and in so doing placed his foot outside the cloth, he was deemed to have run away and the fight would be stopped. If a strike was effective and incapacitating, the wounded party was allowed to stop the fight but was then obliged to forfeit a sum of money to his winning opponent. 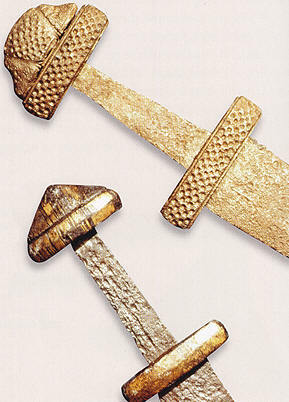 decoration that was common on Viking sword pommels. Settling a feud by single combat with swords is a common theme in Viking sagas. One of the most famous accounts of the bloody use of a sword in such a feud is retold in the Orkneyinga Saga (c.1200), a unique historical narrative of the Orkney Islands that covers the period from its capture by Norwegians in the 9th century until the early 1 200s. The saga recounts how Rognvald, a Norwegian chieftain who ruled Orkney in c. A0860, was burnt to death in his own home by two of Harald Fairhair’s sons. Bent on revenge, Rognvald’s son Einar struck down and killed one of Harald Fairhair’s sons, Halfdan Halegga. The victim’s body was found the next day on the side of a hill, and the shape of an eagle had been cut into his back with a sword. More gruesomely, the ribs had been removed from the backbone and his lungs splayed out to represent the eagle’s wings. 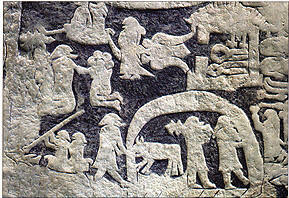 Einar believed this display a worthy sacrifice to the Norse war god, Odin. 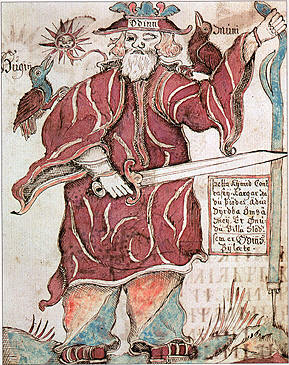 RIGHT: The Norse god Odin with his sword and two ravens. He was the god of war and battle and the bringer of victory. The Vikings were great storytellers and believed that recounting tales was a gift, handed to them by the all- powerful war god, Odin. Without any means of writing them down, the Viking storytellers or skalds prided themselves on recalling epic stories and passing them on to others. Through these tales, the Vikings ensured that details of their religious beliefs and adventures were passed on from one generation to the next. Skalds were often employed by kings who wanted to be revered throughout their kingdoms. Although the stories were likely to have been exaggerated by the skalds, there is probably some truth in their telling of the events that occurred. 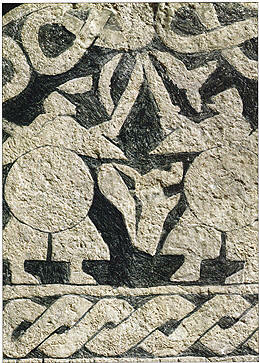 ABOVE: A detail from a stone carving from Gotland representing Valhalla, the great hall of the god Odin. Here warriors enjoyed a glorious afterlife awaiting the final battle against the forces of evil.